POKHARA, July 2: Farmers in Pokhara have started using tractor for plowing their field as it is easier and faster than using a pair of oxen. They have found that plowing the field with tractor costs lesser than using oxen. Gurudatta Adhikari, a resident of Machhapuchhre Rural Municipality, bought tractor in mid-March with financial support from government, as he found plowing the field with tractor easier than using oxen. “The use of tractor is very easy in comparison to the use of oxen. Tractor can plow the field in a single day while the traditional system takes two to three days for the same,” he said. Farmers find no point in feeding pair of oxen for months when they aren’t used while a tractor can be used by fueling it just when it is to be used in the field. “Tractor just needs two to three liters of diesel per day. Two to three liters of diesel can plow the field for almost seven hours,” he said, adding tractor can plow one Ropani of land in just an hour. Likewise, Satya Raj Dhungana, a resident of Pokhara Lekhnath Metropolitan City said that he has also found tractor easier and cheaper to plow the field. “Tractor needs very less human manpower for the operation. I bought tractor for Rs 78,000 in mid-January. A 110 kg tractor has saved both human resource and money,” he said. According to him, farmers in his area have preferred hand tractor given the crisis of human resources in the recent time. According to Ram Bhandari, manager of Bhanu Enterprises, the sale of tractor has been quite good in the recent years. “The hand tractors are imported from China. The sale of tractor is average this year,” he said, adding that people especially from hill districts come to purchase hand tractor. According to him, use of tractor has increased also because farmers find it difficult to get oxen these days. 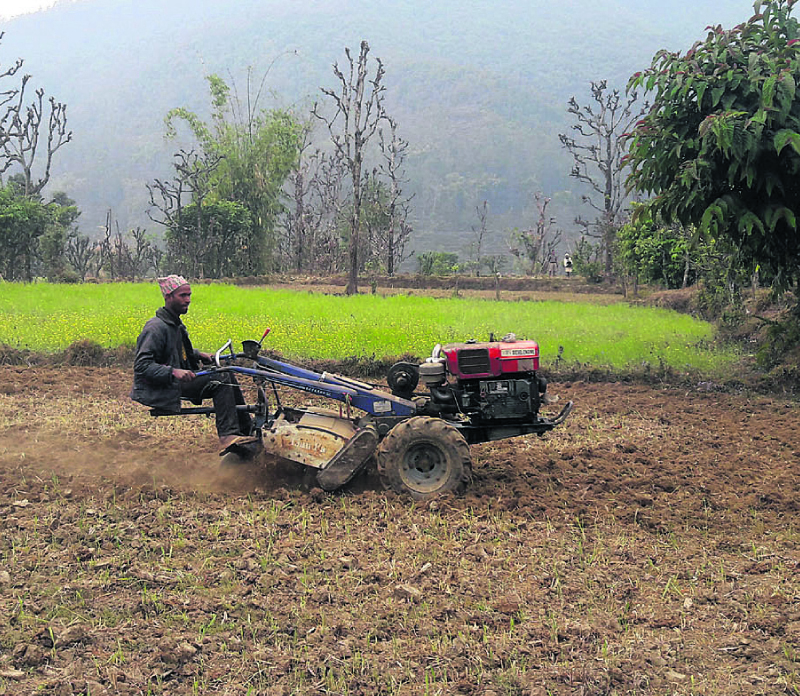 According to Prakash Bastakoti, an officer at the District Agriculture Development Office, the use of hand tractor has increased as it can be purchased from government grant. “The increase in the demand has pulled the use of hand tractor by a huge number. Earlier farmers weren’t able to use the hand tractor easily. But now they purchase tractor only after getting technical know-how about the use of tractor,” he said. He informed that various companies selling tractors have started providing attractive schemes to farmers. The use of hand tractors in the hills as well as terai districts has increased as the government provides grant of 50 percent to the farmers to purchase it. Bastakoti said that a total of 55 units of hand tractors have been distributed in kaski district in the first phase of this year. “We are prepared to distribute 20 more units of tractor in the second phase. The tractor which costs around Rs 70,000 to Rs 80,000 is used by commercial farmers,” said Bastakoti. A total of 50 units of hand tractors were sold last year from the Kaski Office. The office had sold hand tractors to the farmers in 50 percent grants.